A custom tile shower can be a work of art. A well crafted shower can give you that spa like experience every time you use it. Breitzke Carpentry takes pride in crafting custom showers, and goes to great lengths to make sure no detail is overlooked. Porcelain tile shower with glass mosaic accents. This detail of the niche shows our attention to detail with the mitered edges of the tile as not to create extra grout joints. Granite seat atop stainless steel supports looks as if floating in the space. Also notice the slot drain under the seat that almost disappears. Guest bath shower at the Southern Living Idea Home at Whisper Mountain, North Carolina. Slate tile mosaic shower in the master bath at the Southern Living Idea House in Whisper Mountain, North Carolina. Master Bath Shower at the Southern Living Idea Home In Whisper Mountain, North Carolina. This simple design with different sizes of the same porcelain tile is very elegant. 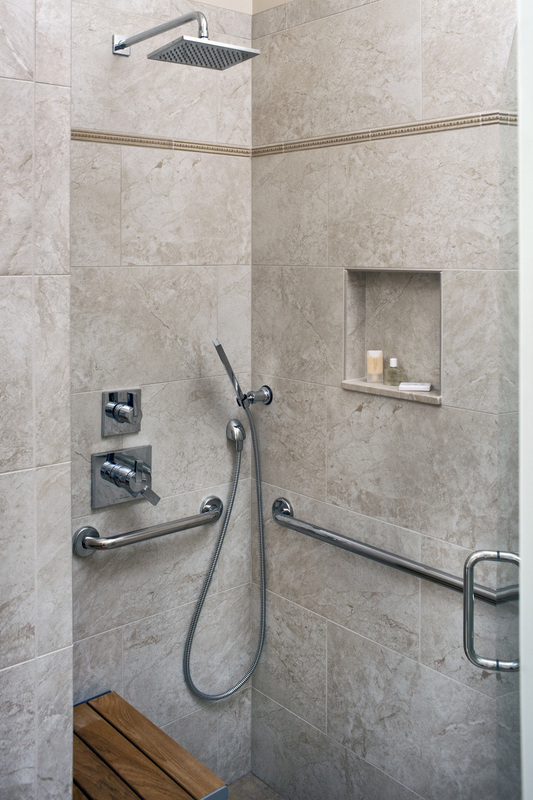 Handicap Accessible Shower in the Ribbons and Roses Room at the Albemarle Inn, Asheville. Slate, porcelain, and river stones all work together in this shower. Sometimes a simple black and white ceramic tile shoer is all it takes to make a room pop. Contact Breitzke carpentry today to get started on your own personal spa.